The appealing feature of the best dividend growth stocks is their ability to boost annual dividends like clockwork. This feature is even more appealing when strong dividend increases are supported by underlying growth in earnings. The Walt Disney Company (DIS) is an entertainment company. The Company operates in four business segments: Media Networks, Parks and Resorts, Studio Entertainment, and Consumer Products & Interactive Media. Disney’s incomparable collection of iconic brands and franchises continues to deliver strong returns to shareholders, as the company raised its semi-annual dividend by 7.70% to 84 cents/share. 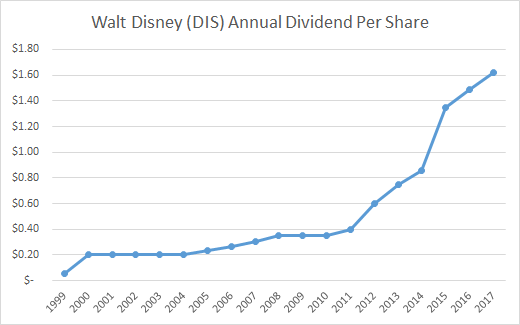 This marked the 8th consecutive annual dividend increase for Disney. The new yield is 1.60%. Over the past decade, the company raised its dividend at an annual rate of 18.80%/year. The strong dividend growth was supported by the increase in earnings from $2.28/share in 2008 to $5.69/share in 2017. Analysts expect the company to earn $6.23/share in 2018. The stock is attractively valued at 16.90 times forward earnings. Check my analysis of Walt Disney Company for more information about the company. McCormick & Company (MKC) is engaged in manufacturing, marketing and distributing spices, seasoning mixes, condiments and other flavorful products to the food industry, including retailers, food manufacturers and foodservice businesses. The Company's segments include consumer and industrial. The company reiterated its commitment to dividend growth, by raising its quarterly dividend by 10.60% to 52 cents/share. This marked the 32nd consecutive annual dividend increase for McCormick. The new yield is 2%. Over the past decade, this dividend champion managed to grow its dividend at an annual rate of 9.10%/year. The strong dividend growth was supported by the increase in earnings from $1.73/share in 2007 to $3.69/share in 2016. Analysts expect the company to earn $4.22/share in 2017. The stock is overvalued at 24.40 times forward earnings. I would consider adding to my position on dips below $85/share.